When thinking about European food destinations the Netherlands may not come to mind as fast as its neighbours France and Italy. Don’t be mistaken however, when it comes to food the Dutch cuisine has a few secrets tucked away. Think crispy, fried and comforting snacks, hearty, warming mains and a bit of fish of course. Not forgetting a mix of caramel and cinnamon with a healthy dusting of sugar on top for dessert. Expat Republic has put together a list of Dutch must-try dishes. Pannenkoeken are the Dutch-style pancakes. They are large and much thinner than American pancakes but not quite as thin as their French neighbour’s crepes. Traditionally they are made with 50% buckwheat flour. Pannenkoeken are eaten as both a sweet and savoury dish. Some favourite toppings include thick syrup or various combinations of apple, bacon, cheese and raisins. You’ll be pleasantly surprised that this lovely dish can be enjoyed for lunch or in the evening for dinner. Unlike the large, thin pannenkoeken, poffertjes are a sweet Dutch street food that look like small puffed pancakes. Made from both normal flour, buckwheat flour and yeast for a fluffy consistency. They are most often eaten on national holidays or during the festive season but can be found (and enjoyed) throughout the year. 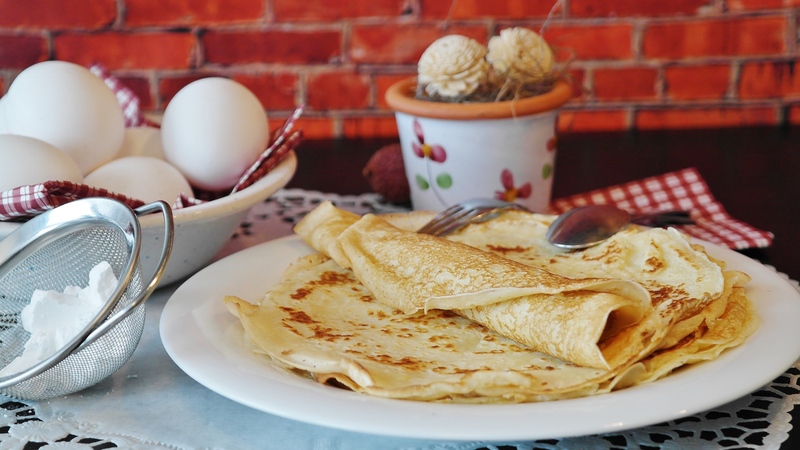 Poffertjes are traditionally served with a dollop of butter and copious amounts of powdered sugar. The perfect accompaniment to a cold beer. The best bar snack on offer in the Netherlands. Delicious crispy fried balls of deliciousness. Usually filled with a beef based mixture but can also be made with chicken or mushrooms for a vegetarian option. The crunchy outer layer breaks open to reveal a steaming smooth mixture of meat (or mushrooms), flour, butter, herbs and spices. Dip in the accompanying mustard and try to resist a bite until they’ve cooled down a little! Closely related to the bitterballen, but bigger (and some would say better). Krokets are originally made from beef or veal but different variations like chicken satay or prawn are becoming more common. These crumbed and fried pieces can either be eaten by themselves or, as the Dutch prefer, in a bread roll. It’s such a popular food that there is even a McKroket burger! 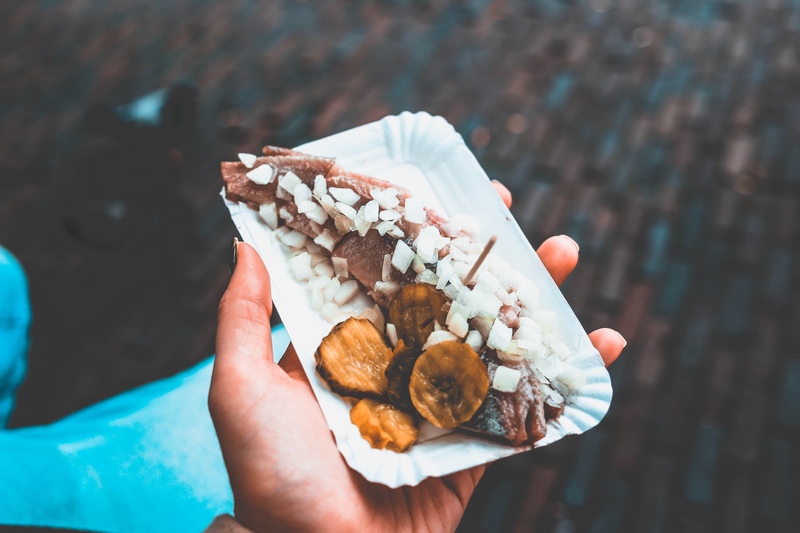 Perhaps one of the most unpopular items of Dutch cuisine among the non-Dutchies is Haring “Hollandse Niewe” or New Dutch Herring. Essentially it is herring that has been kept in salt or brine, served with chopped onions and gherkins. It can also be served in a bread roll as a ‘broodje haring’. However, if you want to eat it like a local, hold the fish by its tail, tip your head back and eat the flesh off piece by piece. If semi-raw herring isn’t exactly your thing, why not try kibbeling instead? Kibbeling is basically Dutch fish and chips…without the chips. They get enjoyed by themselves. Deep fried pieces of fish served with either mayonnaise, tartar or garlic sauce. Probably the most popular (and one of the most delicious) foods created in the Netherlands. 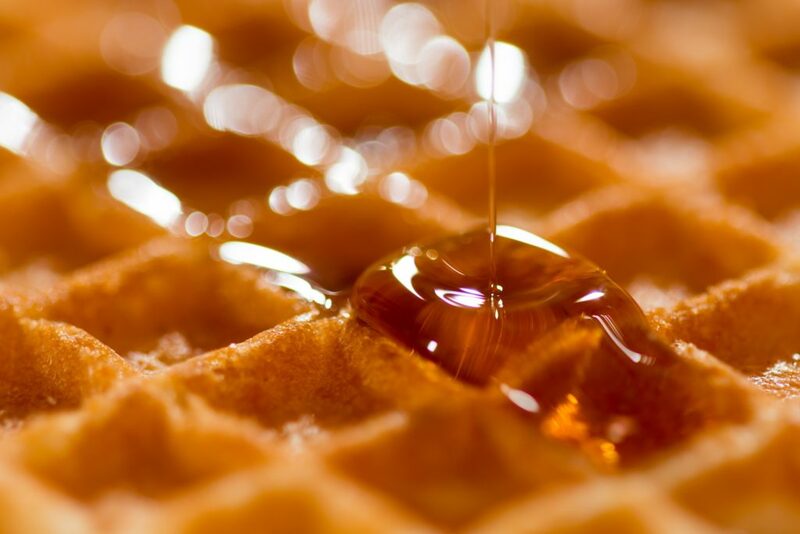 The stroopwafel is essentially two thin waffle biscuits stuck together with a sticky caramel-like syrup. Best enjoyed warm while the syrup is still runny! Olibollen literally translates to oil balls. They are traditionally served around New Year. Olibollen are similar tasting to doughnuts and can either be plain or with raisins. And of course, they are served with a generous dusting of powdered sugar. You’ll also definitely want to try the new innovations such as the chocolate or Nutella Olibollen, those are, as the dutch would put it : “lekker”! Did you know that each year the Dutch consume more than 2kg of liquorice per capita! 2kg! Liquorice, or drop as it’s known in the Netherlands, can be found just about anywhere. While it comes in all sorts of flavours, shapes and sizes, the main (and probably most important) difference, is sweet or salty. 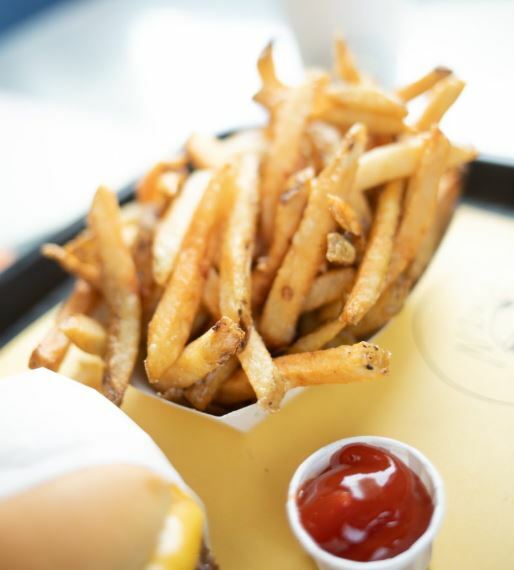 Patat, Frites or most commonly known referred to as French Fries (even though they’re not really from France). No matter where you look in the Netherlands, you’ll most likely manage to spot someone eating fries. Served in a paper cone with a choice of tomato ketchup, mayonnaise, curry sauce, Joppiesaus or peanut sauce. A famous Dutch combination is called “patatje oorlog” which translates loosely to “war of fries”. These are fries with mayonnaise, chopped raw onion and peanut sauce. Apparently, it’s delicious. Sticking with the potato theme we have stamppot, one of the oldest Dutch recipes. It consists of mashed potatoes mixed with one or more other vegetables. Usually kale, carrots, sauerkraut, onions or endive. Historically served as a winter dish as it was able to both fill you up and warm you up simultaneously. You can’t come to the Netherlands and not try the Dutch cheese! They’ve been making cheese since for centuries. In fact, the earliest cheese making equipment found dates back to 200 B.C. Gouda is definitely the most famous but there are so many others to choose from too. The Dutch produce around 650 million kilograms of cheese annually, two thirds of is exported. This makes the Netherlands the largest cheese exporter in the world. Hagelslag are simply sprinkles. The Dutch love them. They are a hugely popular sandwich filling and are unmissable in the supermarket. Hagelslag comes in a range of flavours including aniseed, forest fruits and of course chocolate. The Dutch certainly know how to make warming winter food and erwtensoep is another fine example. This thick soup is made mainly from split peas along with some other vegetables is the perfect dish for a cold day. Traditionally it also contains pieces of rookworst smoked sausage to make it that bit more hearty and filling.